-Asia supply chain management (12-year experience in sourcing, order follow up, quality control,logistics in Asia). I am an out-going person who is warm hearted and with a sunshine smile, trust worthy and very thoughtful. The wisdom of life gives me a great sense of humor and a business mind. I have many interests beside business: traveling, dining out at different restaurants, culture, history, oil-painting, poems, movies, music, so I will also be your perfect tour guide, a charming lady to go out with. I am both efficient and reliable and take great pride in ensuring my clients get first class service every time. June 2005 Shanghai International Auto Show, presentation for imported German Volkswagen cars. Editor-in-charge, Juvenile & Children Publishing House(one of the most famous publishing house in China), managing the whole process: from connecting authors to promoting books to market. Agent for an Australian company, dealing with their business in China, and the guide and translator when they come here to visit the suppliers or attending trade fares. We have been to Hongkong, Wenzhou, Xiamen, Quanzhou and Guangzhou for business meetings and trade fares. 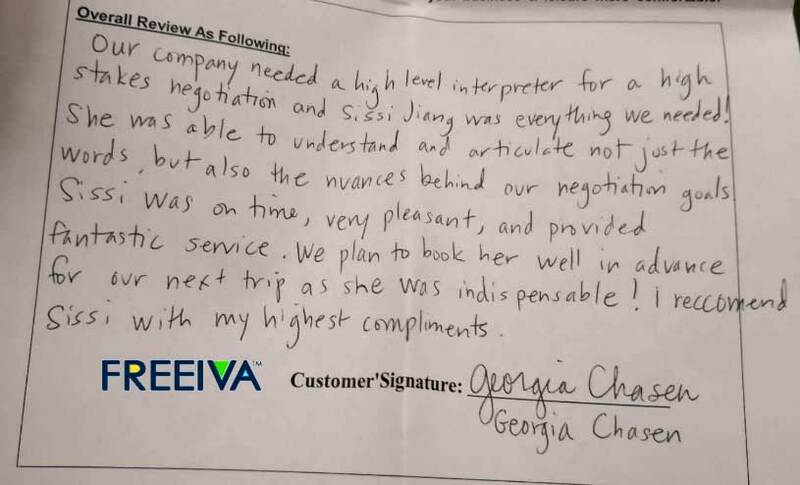 Our company needed a high level interpreter for a high stakes negotiation and Sissi Jiang was everything we needed ! She was able to understand and articulate not just the words,but also the nuances behind our negotiation goals. Sissi was on time,very pleasant,and provided fantastic service.We plan to book her well in advance for our next trip as she was indispensable! I recommend Sissi with my highest complements. Sissi did an excellent job with communicating with my supplier working out many technical details.Easy to travel with and a great knowledge of Shanghai & surrounding regions.Will definitely use her service again. Sissi was an excellent IVA. She was very accommodating,has excellent language skills and is very professional. I was very happy with her service. Sissi was very interested in our product & learning about the industry.She was interactive & friendly & joined our sales effort with ease.We would gladly use her again in the future. Sissi has been very professional in communication and scheduling.She has done research and can give relevant insight on our business needs.I look forward to working with her again for our business in China. We were absolutely satisfied with her attitude and her level of service.We intend to use her service also in the future.Many thanks. Sissi did a great job.All of our meetings were very successful and much of it can be attributed to her supplier knowledge and experience.She is a great negotiator and we would recommend her to anyone looking for suppliers in the Shanghai area.Thanks Sissi! Sissi speaks very good English.She is very helpful in finding things & has excellent resources.I would recommend her to anybody looking for assistance while here.Great personality makes being in a foreign country a comfortable experience. Sissi has again been an excellent support for our business in China. Sissi is punctual,professional and would recommend her service to anyone requiring translator support in China. We were absolutely satisfied with her attitude and her level of service.We intend to hire her service also in the future.Many thanks. She speaks perfect English, is incredibly attentive, and does an amazing job of helping us organized and on-schedule. Sissi's English is very very good. She was very assertive and professional with all business meetings. Sissi arranged meetings with 5 factories and they were all relevant to our business and very successful. She is very timely and explains things very well. I am very satisfied with all aspects of her service and thank freeiva for providing such a good service. Sissi is excellent! She is very good at understanding and translating English.She was very accommodating of our requests.We spent 2 days with her and will definitely request her in the future. Our trip to China would not been possible without Sissi's assistance.She organised our travel plans and meetings which ensured they were successful. Her English is fantastic and I will definately use her service for any future trips to China. A highly skilled and qualified professional translator.Very satisfied to work with her.She helped us to get through good business deals accomplished. Sissi did a great job for us.She did well for technical training of operators. I look forward to working with her on my return business trip to China. Sissi is an absolutely professional and intelligent assistant. Helped me a lot.Without her I would spend much more money.Highly recommended. Very helpful with all aspects of our trip.It was great to have someone flexible to change as our trip required change. Sissi has an exceptional talent,knowledge and understanding of the English language. Has been very helpful and resourceful during business dealings?Talented and patient,punctual always on time!She was also well liked by my associate. I would like to thank the freeiva service for providing an excellent individual to assist me during my travels in China these last two weeks. Sissi Jiang has very good English language skill and was invaluable during several negotiations carried out in many situations.She was an excellent companion,friendly and patient with the challenges we encountered.Sissi is very professional and during the many factory visits we attended she intuitively responded correctly to high level discussions. My over all opinion is that Sissi Jiang is '5 star'. Sissi was great!She made our trip very special.Her English is perfect and her help was also excellent!Thank you,Sissi. We were very satisfied with Sissi,her services,and the Freeiva team.The trip went well!The success has everything to do with Sissi's expertise. Siss was very helpful with the factory visit.I would highly recommend her. Sissi's interpreter skills are excellent. Sissi has spectacular in all that she did,utmost efficiency,very caring,consideration to special need,advice on best options(cost and ease of travel).We commend her for service provided.Will certainly use her services again. Sissi is someone that I would highly recommend to someone looking for everything in English/Chinese interpreter, she is very professional, prompt, honest, I only used her service for four days in Shanghai and feel that I can trust her to expend my relationships with my renders in China. My daughter and I was very pleased with Sissi. She was very helpful with both the business I had to take care of and the sightseeing I did with my daughter. It was a pleasure with her and would have been impossible without her. I highly recommend her!! We had a perfect day with Sissi. Her English is terrific and has ability work with our needs, helped us greatly. We contain to request her again. She is professional! Sissi was very good for my trip. Sissi organized meetings, taxis, dinner, negotiated and talked with talked with clients. Sissi was always very well presented and very profetional. Sissi was extremely helpful throughout our business trip and was invaluable during negotiations with the textile companies we met. We would have no hesitation in recommending Sissi for her translating skills and her friendly, positive attitude was a pleasure. Sissi was very professional and excellent as a tour guide. She knows the locations and history of Shanghai very well. Her language capacity and process is excellent. Very happy client! Sissi provided exceptional support for our exhibition as Medtec Shanghai. She easily assisted with our preparations before arrival, and was very flexible in supporting our arrival and both set up activities. Her written and spoken English skills are very strong. Sissi was very professional at the Expo, We were thrilled to have her represents our company to our Chinese both visitors. She was courteous and attentive, and very quickly a convened a firm knowledge of our products. The Expo was a success fair. Due great part to Sissi’s assistant, we will recommend her to colleges planning a visit as well. Sissi made our stay at Shanghai really enjoyable. She is a pleased girl and we felt very comfortable with her. Her planning of our short trip in Shanghai was perfect. We like to have her as our guide for our trip. It was a pleasure having Sissi helping me on my business trip in Shanghai and Nanjing. She made everything so easy, arranging my transportation, hotel and meetings. She is friendly, kind and charming. On my full day, she was an excellent tour guide in Shanghai, showing me places I could never find on my own. I would definitely recommend her and request her when I’m back in Shanghai. Sissi is a wonderful girl, professinal assistant, very helpful. She help us shopping and she show us a lot of interesting places in Shanghai. Thank you very much for all youe help and I will use your service in future. I came to China for the first time and brought my 8 year old daughter to travel with me. We traveled in Shanghai and met Sissi who greeted at the hotel. Sissi interviewed us and took notes regarding our expectations. She guided us from that moment on for six days with precision and professionalism. We toured through Shanghai, traveled Zhouzhuang and Suzhou. We enjoyed Sissi’s company as much as the beauty of the water, village and the serenity of China’s gardens. Sissi was equal professional while interpreting during my business meetings in Suzhou. She really was a joy spend our time in China with. I will recommend Sissi to anyone. My daughter and I will miss her and hope someday she can came to America to visit. I was very satisfied with her service, flexible to adapt to her success, and her English is proficiency. I must say that Sissi, our reliable guide was more than helpful, completely professional with outstanding skills in her command of English. She helped us exceeding our expectation, of course will recommend her and your agency in the future. Sissi is very well mannered, extremely helpful and very accomodating, she does her homework and research before meeting up with us, fulfilling all our request and making our tour a lot more enjoyable. Thank you for showing us a side of Shanghai we never would have seen ourselves. She has great negotiating skills and a lot of fun to shop with. Sissi was very professional and helpful during my stay in China. Her professionalisim & diplomacy were outstanding. I would recommend her for any translation or interpreter work. Sissi is a wonderful girl and we found her to be very very perfect in her profession. Sissi was very accommodating, met me at the airport, arranged taxis, organised return airport transfer for me. Sissi was helpful when approaching business contacts, translating business requirements and discussing general business. Sissi was excellent while assisting me on my business trip. English is fantastic, as well as her knowledge and experience with different cities. Her communication with suppliers and contacts I met was very professional. She is responsible for making this business trip a success, as well as my enjoyment with tourism in the city. Sissi is an excellent guide and a credit to her profession. I will definitely recommend her to my colleagues and business contacts. Sissi is an excellent companion. She helped in shopping and negotiating. For my next time also I would prefer Sissi to be my guide. In my opion, Sissi is a perfect guide as her knowledge of the city as well as her English is very good. My visit to Shanghai would have been useless with out her. Sissi has been an excellent interpreter, with strong English language skills, a good understanding of business negotiations and the highest level of professionalism. She handeled high-pressure presentation easily. She also was a good companion, with a charming personality. I would recommend her service unreservedly. A very good experience that aided business. Sissi was a fantastic guide today. She was very cheerful and accomodating to my requests. She had many different and interesting ideas, and was extremely helpful & professional. Very helpful, very good interpreter. Sissi was really fantastic! She knew all the places that I needed, was able to give me invaluable insights into issues related to a new business venture we are consindering and was wonderful to be with. Of all the things my company has done to further our China Initiative, working with Sissi was probably the most productive and definitely the most enjoyable. Very nice, very knoeledgable, very smart, very enjoyable to be with. Sissi did a very professional job. She was very knowledgable and skilled at her work, language was never a problem, very good English, I highly recomend her! I like Sissi b'cos she is very good in English and very friendly. So nice girl. Sissi has been an excellent guide & interpreter. Her knowledge of Shanghai proved invaluable in arranging site visits and ensuring all travel arrangements went smoothly. Her professionalism and ability to respond to complex organizational requirements led to a perfect and enjoyable visit. Thank you. Sissi's contribution was perfect. She has nice personality and provided professional service. We were a group of 4 men visiting Shanghai to see Formula.1. We had a wonderful introduction to Shanghai from the moment Sissi met us at the airport until we left 5 days later. Sissi is very profesional, very punctual and a fantastic tour guide. She accompanied us from early in the morning till late at night. Her choice of cultural visits and restaurants were excellent. She was very well organized and accommodated our requests from shopping to searching a bar to watch American football World Cup. I can truely recommend her! A wonderful guide, engaging, informative, smart and very helpful. A very nice person who made a city tour of Shanghai a smooth and happy experience. I definetely recommend her to anyone. Sissi has been completely excellent. Her communication skills are first rate. She is very well organized, she has show a lot of initiative and imagination, and she has been dependable and helpful at all times. Most important of all, she has been fun to be with, whether business or touring was involved. I recommend her very highly. Sissi was an exceptional guide and a highly professional assistant. I would not think twice before hiring her services again while in China. Sissi is a good translator & we will hire her again. Her English is very easy to understand. Sissi is a great company when you are in Shnaghai.She is intelligent and professional, speaks excellent English and ajust well to your likes. She can be your tour guide in the city and beyond, gives good advices for shopping, finds the perfect restaurants for your taste and is a charming lady if you want to go out. Sissi is the perfect choice to have a great time in Shanghai. My opinion on Sissi Jiang is very good. Very creative and intelligent, very accommodating to requests. Excellent guide I got to see many things that I never would have seen otherwise. Sissi is a great tour guid. She did a perfect job. Sissi's English is excellent. She arranged time perfectly on our each meeting. Also a great conversationalist. Helped to solved many problems we used to have with those factories. Sissi has been a fantastic help to us on our visit to Shanghai. Her English is excellent and she has been most helpful with our shopping and visiting to various places in Shanghai. We would highly recommend her to anybody coming to Shanghai. Sissi Jiang assisted me on my holiday to Shanghai for 7 days. She was not only my guide and interpreter, but my dependable companion. She always thought ahead and planned meticulously, so I could achieve all and more than I originally scheduled. Thank you Sissi for your cheerly sense of humour and a wonderful holiday. IVA( Sissi) will reply you later, you can login in your account to check IVA's reply ( View "Inquiry List" ). And you can discuss more details with IVAs.